One of my favorite go-to rigs for fishing cold water is the float n’ fly rig. This very simple and easy to use setup marries the traditional “bobber fishing” approach we learned as kids with a sophisticated technique to create an effective weapon. It doesn’t take long to tie the float n’ fly rig and start catching fish. Here are four tips to help you master the float n’ fly rig in no time. The float n’ fly consists of a small marabou jig rigged under a bobber and twitched slowly in deeper water. All you’ll need to is a float/bobber with a hook clasp, a three-way swivel, a lightweight jig and a length of leader. Simply tie your main line to one eye of the swivel, clasp your bobber’s hook to another eye and attach your leader to the remaining eye, with the lure tied to the end. The keys to using the float n’ fly rig are depth and speed. Since you decide the depth of the leader, put it where the fish are and retrieve the rig at a slower speed that imitates baitfish. 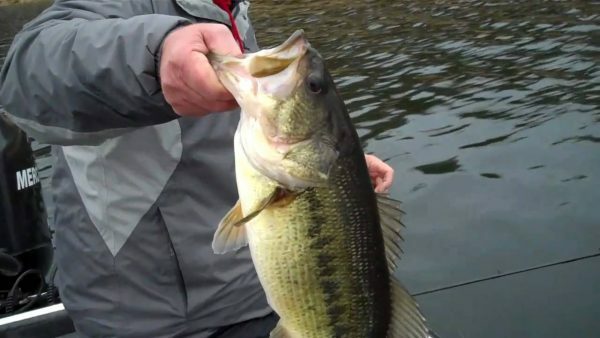 In winter, bass will suspend anywhere from 10 to 14 feet, near rocks and structure, as moving requires more energy during the colder months. Since a fish’s metabolism slows as the temperature drops, requiring them to eat less, this slower presentation allows them the opportunity to feed without exerting a lot of energy. You’ll need a longer rod to make the float n’ fly rig easier to use and also more effective. There are companies that make rods specifically designed for the setup, such as B n’ M and Bass Pro Shops, which make float n’ fly rods in 8 to 11 foot lengths. Of course, you can also use any brand you like, as long as you make sure to grab a longer, lighter action rod. The float n’ fly rig requires a different cast than many are used to, due to the longer leader that makes conventional casting difficult. First, you’ll need to work the rig out in front of you and then make a slow back cast behind you. When you hear the bobber hit the water behind you, make your forward cast. Once your bait is in the water, point your rod tip right at the bobber and shake it slightly to create a twitching action. Now, when you get a strike, sweep the rod up—not to the side—to get the hook into the roof of the fish’s mouth.